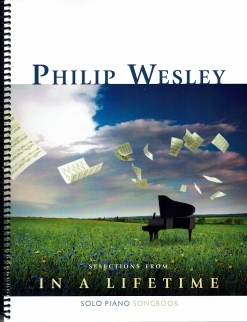 The Selections From In a Lifetime songbook is the companion sheet music book to Philip Wesley’s second album, released in 2004. Ten of the fourteen pieces from the recording are included. Those not included are “Comfort and Joy,” “Greensleeves,” “In the Eyes of a Child,” and “Nights in White Satin.” (The first three of those pieces are included in Philip’s Comfort and Joy songbook as well as in some of his compilation songbooks.) 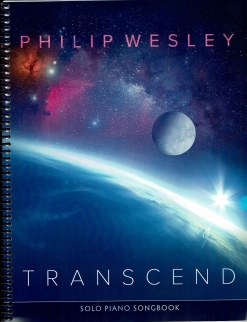 Most of these pieces are at an upper intermediate level, and fans of Philip’s music who are more advanced should find this book very pleasant to just sit down and play. A couple of pieces have chords with a reach of more than an octave, but there are footnotes that that those chords can be rolled or shortened. Most of the timing is quite straightforward, and none of the pieces are in difficult keys. The book has been transcribed to be as close to the recording as possible and is printed on a bright white medium-weight paper stock. The notation is roomy and easy to read, all of the pieces include metronome settings, and all but one have suggested pedaling. 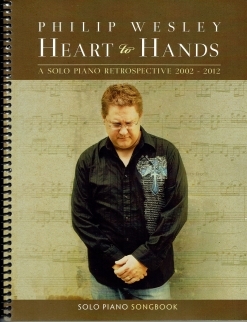 Front and back covers are full-color reproductions of the current CD cover artwork (not the original black and white cover with Philip’s photo on it). The book is spiral-bound, so it will stay in good shape for many years of playing enjoyment. 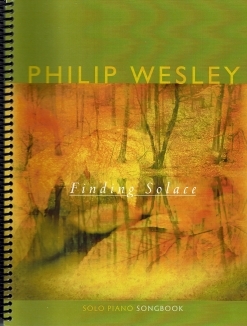 All of Philip Wesley’s songbooks are currently available exclusively from www.PhilipWesley.com. Recommended!